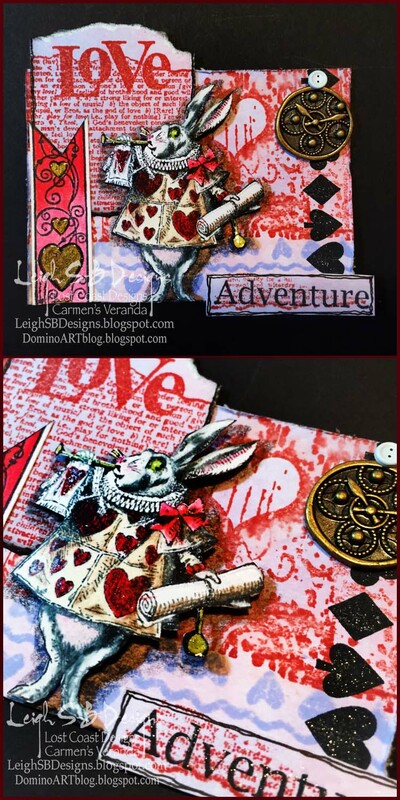 Velvet Paw Creations: "Love Adventure" Wonderland ATC - Valentine's Week project #2! "Love Adventure" Wonderland ATC - Valentine's Week project #2! We are counting down to Valentine's Day with a week of LOVE and sharing over at Lost Coast Portal to Creativity! Stop by daily for fabulous Valentine inspired projects by my fellow LCDesigners! Would you like the chance to win a $10 shopping spree at Lost Coast Designs and Carmen's Veranda? We'd love to know what you love about our rubber stamps and what you think of our activities at Lost Coast Portal to Creativity so write us a little review on your blogs and include some of your past or new projects featuring our stamps. Then share your review with us via the link-up on the Day one post HERE! Yesterday I shared the first of my 4 projects and now here's my 2nd, a Wonderland inspired ATC! Featuring Lost Coast Designs White Rabbit - Rabbits, Cat Face, Hatter, Grunge Border 2", Love Dictionary, Hearts and Curls border, Hearts border, Heart Diamond Spade Club border and "Adventure" Misc Words set. I started out by applying Fired Brick and Shaded Lilac Distress Inks to white cardstock with foam applicators, cut out the ATC and then stamped the Grunge Border in Fired Brick, making sure the Heart was prominent, the Hearts border in Shaded Lilac Distress Ink and the card suites border in black Versafine ink. The Love Dictionary was also stamped in Fired Brick with a subtle Fired Brick/Shaded Lilac background. The "Adventure" text was stamped with black Versafine onto a piece of scrap background with a portion of the Dictionary stamp on it, I thought that looked pretty cool. The White Rabbit was stamped in black Versafine Ink and I coloured him with PrismaColor pencils and included some metallic gold details. I used the Hearts and Curls border to make the little flag on the left side which was also coloured with PrismaColor pencils and the hearts coloured metallic gold. Rabbit was fussy cut out and adhered to the ATC with pop dots. For yummy dimension and sparkle I applied Vive Pearl Magic Transparent White pen to all the metallic gold areas and clear Wink of Stella to the large LOVE, card suits border, the rabbit and the Adventure text. I completed my Wonderland inspired ATC with a brass clock charm and a tiny white button brad. Stop by again tomorrow for my 3rd project and I hope I've inspired you to also pop over to the Portal and join us for Valentine's Week! "Let Love Fly" ATC - Valentine's Week project #3!